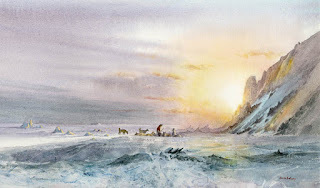 This entry was posted in Arctic watercolours, atmosphere, David Bellamy, Painting wildlife and scenery, ST Cuthberts Mill, Watercolor mountains landscapes, Watercolour mountain snow landscape, Winter landscapes in watercolour and tagged #arcticwatercolours, #saunderswaterford, Arctic sketching, St Cuthberts Mill by Jenny Keal. Bookmark the permalink. Not just a brilliant artist – a lovely turn of phrase too – very evocative, thank you.